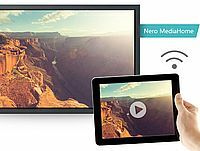 The Nero Streaming Player app allows you to play photos, video and music straight from your smartphone or tablet on your Smart TV or other media player in your home network. You can also use it as a remote control and as a player for a PC. Nero TuneItUp is an advanced comprehensive solution for cleaning Windows-based PCs, making them run faster and keeping software up-to-date. Nero is headquartered in Karlsruhe, Germany, has offices in Glendale, CA (USA), Yokohama (Japan) and Hangzhou (China). More Formats, Functions, Technology and Security makes the new Nero 2017 a ‘must-have’ in everyday Digital Life. Karlsruhe, Germany (October 5, 2016). 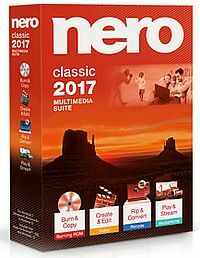 Launching today is the latest version of Nero 2017, the successful multimedia software for burning, copying, creating, editing, ripping, converting, playing and streaming media content. 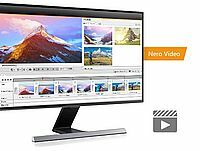 This latest edition sees significant improvements such as ease of use, playback, video editing, transcoding and burning, as well as sharing videos, photos and music in the highest quality. Nero is positioning itself as users ‘best-friend’ for day-to-day digital life. 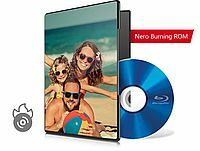 For example, through support for the HEVC (H.265) format, SecurDisc 4.0 for the highest security standard for burned discs and the Nero KnowHow App, which enables users to get the best out of their Nero software. Nero users have thousands of photos, videos and other multimedia files stored on lots of different devices such as smartphones, tablet PCs, laptops and desktops. Looking for a specific file can often be like searching for a needle in a haystack with users trying to remember where they saved it. The Classic and Platinum versions of Nero 2017 put an end to this by allowing users to search via timeline, faces, places and tags. 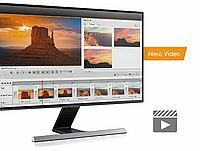 While the Nero 2017 Classic multimedia suite includes extensive functions for mastering the day-to-day digital life, Nero 2017 Platinum delivers especially high-quality results thanks to cutting-edge technology (HEVC/H.265) and advanced functions. 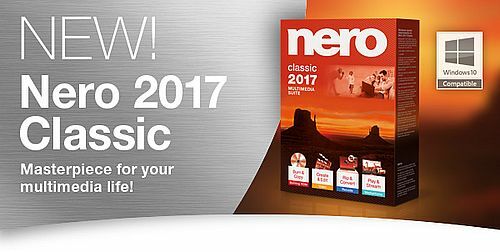 Getting started with Nero 2017 Classic has been optimised and tailored to meet users’ needs. Nero QuickStart makes the ten most common tasks for photos, videos and music available immediately. Simply select the desired media content, add it to the appropriate project and enjoy the results, or switch to the familiar excellent playback in all popular formats. 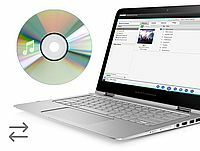 Support for Gracenote® technology in the Nero MediaHome universal media center ensures that songs are always shown with the original album cover and can also be transferred to mobile devices. This means that users can simply and easily play their favorite songs using the familiar album cover. Another new feature is the ability to play back films with existing subtitles (SRT files). In addition, users can easily add and play back additional subtitles using drag & drop. And there’s something else that makes working with Nero 2017 Classic now even easier; In the past users could expect to spend a long time exporting various highlight scenes from a long video film. They can now do this very quickly and in one go with the new “Multi Export” function. Nero’s industry leading burning technology has also been further enhanced. 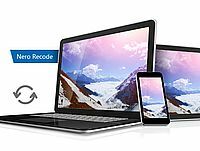 Users wanting to add special security to their images, music, videos and data can now use the new SecurDisc 4.0 feature with powerful password protection and 256-bit industry-standard encryption. This keeps sensitive data highly protected and the burned discs are particularly durable. And that’s not all! 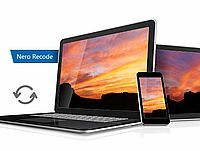 Nero 2017 Classic now comes with the latest in-device support for converting files to mobile devices and provides 1-click conversion of audio CDs to connected smartphones and tablet PCs as well as all Gracenote® information in the file, including album cover, transferred to the mobile device. Gracenote® functions are also available on disc when burning CDs and DVDs with MP3 or AAC files for a car radio. 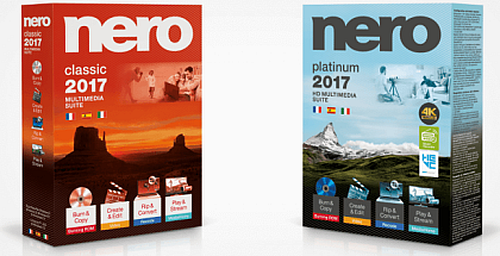 Anyone wishing to get even more from their multimedia files can rely on the Nero 2017 Platinum suite, which provides all the functions of Nero 2017 Classic and delivers especially high-quality results for playback, video editing and output thanks to its advanced functions. Here, users requiring especially high quality will see their demands met. Besides improved Ultra HD (4K) support for playback, video editing and output, the Platinum suite has been extended to include the new, very high-quality HEVC format. Also known as H.265, “High Efficiency Video Coding” delivers significant improvements to picture quality in HD and 4K while halving file size. 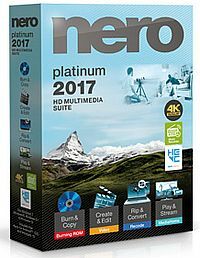 HEVC is used in Nero 2017 Platinum for playback, video editing and transcoding. The number of devices that support HEVC is growing so users of Nero 2017 Platinum are well set to benefit from the format at no extra cost. 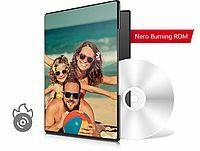 Alongside over 300 additional effects, video filters and templates for video editing, Nero 2017 Platinum also brings numerous enhancements in the area of 4K. For example, 42 4K-optimized templates can be used to create film or slideshows automatically and hundreds of 4K effects can be embedded as native into 4K projects and also output in full 4K quality. 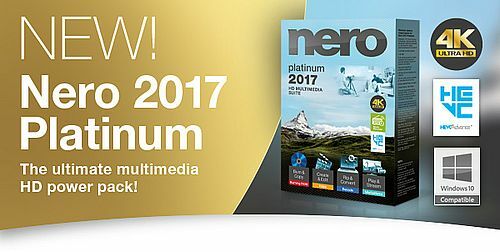 Tried and tested functions and spectacular effects like picture-in-picture, chroma-keying, slow motion, time lapse, tilt-shift and many more are all included in Nero 2017 Platinum. For music fans, Nero 2017 Platinum continues to offer the Music Recorder. It enables users to record MP3s from thousands of radio stations free of charge. Nero 2017 also takes changing user behavior into account by offering numerous free, new and optimised apps. They add even greater performance to the extensive range of features in Nero 2017 Classic and Nero 2017 Platinum. The Nero KnowHow App was created as a simple, fast and clear interactive learning guide. It assists users with their multimedia projects, gives them answers to frequently asked questions (FAQs) with useful tips and tricks and offers direct access to more than 50 short video tutorials, contains application manuals, a glossary and more. In Windows 10 it can be accessed directly from the relevant application or from the start menu. It can also be used at any time on the move via smartphone or tablet PC (iOS, Android, Windows® 10 Phone). The Nero MediaHome WiFi Sync App has been optimised and now also made available for iOS. With it, users can very easily transfer photos and videos from their mobile device to their PCs and send their favorite songs from their PC back to their mobile device wirelessly – in the highest quality. Better and faster transmission technology and availability for iPhone and iPad mean that truly all Nero users can now benefit. 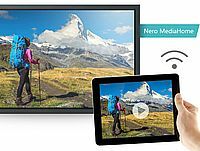 The Nero Streaming Player App has also been enhanced, making it even simpler to stream images, video and music on smartphones and tablet PCs (iOS and Android™) to a smart TV in the home network. This now means that zooming and rotating on a smartphone can be displayed on a smart TV in real time. And last but not least, the app also makes it possible to search the Nero MediaHome universal media center straight from a mobile device and to play photos, slide shows, music and music playlists from a PC on a smart TV. The Nero Receiver App has also seen significant enhancements. In addition to Nero MediaHome, countless other UPnP/DLNA media servers can also be used to play media from a mobile device using the app. With the Nero Streaming Player App as a server and the Nero Receiver App as a receiver, media files can now also be streamed wirelessly from one mobile device to the other. Parempaa turvallisuutta levyille ja tiedostoille, nopeampaa videoiden muokkausta ja entistäkin yksinkertaisempaa käsittelyä? Kyllä onnistuu! Nero 2017 Platinum takaa tunnetusti parhaimman laadun, tuliterät ja laajat toiminnot, vahvan teknologian ja digitaalisen opastuksen, joka tukee entistä paremmin digitaalisia tehtäviäsi. Sukella sisään Nero 2017 Platinum -nautintoon uuden Nero QuickStartin avulla ja tartu tärkeimpiin tehtäviin käden käänteessä. Tästä eteenpäin pääset aivan yhtä nopeasti: olipa kyseessä ääni-CD, DVD tai Blu-ray Disc™, luotettavalla Nero-teknologialla saat kuvat, videot, musiikin ja tiedostot kopioitua ja poltettua pitkäaikaisesti. Jos haluat olla täysin suojattu, SecurDisc 4.0 ja sen salasanasuojaus sekä 256 bitin koodaus takaavat, ettei kukaan muu pääse käsiksi siihen, minkä haluat pitää omana tietonasi! Uusimman Nero 2017 Platinumin avulla pääset parhaisiin tuloksiin ja toteutat multimediatiedostoja hyödyntäen luovuuttasi lukemattomin keinoin. Tuo myös korkealaatuisia HEVC (H.265) -tallennuksia tai siirrä 4K- ja HD-filmejä älypuhelimista, digitaalikameroista ja kameranauhurilta tietokoneelle. Houkuttele yleisöä Expressin tai laajennetun videomuokkauksen avulla ja valitse 4K-filmimalleja sekä yli 800 upeaa tehostetta. Vie yhdessä hujauksessa yksittäisiä kohtauksia pitkistä filmeistä. Laadi DVD-videoihin™ ja Blu-ray Discs™-levyihin korkealaatuisia valikkoja hyppäyksistä haluamiisi kohtauksiin, luo Nero CoverDesignerin avulla kansia oman makusi mukaan sekä nauti filmien ja musiikin parhaasta toistolaadusta. Mitä puuttuu vielä? Popcorn! Yhdistä se, mikä kuuluu yhteen: muunna kaikki muodot korkealaatuiseen HEVC-muotoon (H.265), jonka voit muuntaa puolestaan lähes mihin tahansa tarvitsemaasi muotoon. Rippaa video-DVD*-, AVCHD* ja Blu-ray Discs™*-levykkeet sekä käytä tiedostoja edelleen uusissa projekteissa. Yhden napsautuksen konvertoinnilla siirrät ääni-CD:t suoraan yhdistettyyn mobiililaitteeseen. Näin Nero valitsee automaattisesti yksinkertaisimman konvertoinnin ja parhaan äänen laadun. Kytke virta kaiuttimeen, aseta kuvaruutu paikoilleen: löydät ja katselet valokuvia, tekstitettyjä videoita ja musiikkia Nero MediaHomella nopeasti, mutta optimoidulla Nero MediaHome WiFi Sync -sovelluksella tuot ne myös pikavauhtia mobiililaitteestasi ja siirrät lähes joka laitteeseen – olipa kyseessä iOS- tai Android-älypuhelin tai -tabletti! Voit toistaa lähes kaikkia audio- ja videomuotoja, jopa 4K- (Ultra HD) ja korkealaatuista HEVC-muotoa. Gracenote®-liitännän ansiosta voit etsiä musiikkikappaleita mobiilipäätelaitteiltasi albumin kansien perusteella ja nauttia musiikista vielä enemmän. Laajenna omaa musiikkikokoelmaasi Music Recorderin avulla ja tallenna tuhansilta nettiradioasemilta MP3:n avulla täysin laillisesti. Kuulostaa hyvältä! Tee digitaalisesta elämästäsi menestystarina Nero 2017 Classicin avulla. Vanha klassikko uudessa kuosissa tuo optimoinnin joka alueelle: klassikkomme ansiosta luovaa ja nopeaa muokkausta, parasta mahdollista turvallisuutta poltettaessa, korkeaa toiston laatua, yksinkertaista vientiä ja paikasta riippumatonta nautintoa monipuolisesta musiikki-, valokuva- ja videotiedostoista ei estä mikään! Olipa kyseessä CD, DVD, Blu-ray Disc™: kopioi ja polta kallisarvoiset tiedostot luotettavasti alan erikoistuntija Nero 2017 Classiciin. Tämä onnistuu vieläkin helpommin Nero QuickStartilla, joka mahdollistaa pääsyn tärkeimpiin tehtäviin yhdellä napin painalluksella. SecurDisc 4.0:n ja 256 bitin koodauksen, salasanasuojauksen ja levyn optimointiteknologian ansiosta voit myös olla aina täysin varma tiedostojesi pitkäikäisyydestä. Automaattisen äänentoiston parannusominaisuuden avulla voit polttaa jopa audio-CD-levyjä erityisen helposti ja korkealaatuisesti sekä liittää mukaan albumin kannet. Toista videoita, valokuvia ja musiikkia lähes miltä tahansa päätelaitteelta tietokoneella, vedä ne Nero 2017 Classicin aloitusruudulle ja pääset heti omaan multimediastudioosi! Voit muokata käden käänteessä omia filmejäsi luovilla tehosteilla, määritellä siirtymiä, valita upeita kirjasimia ja antaa lukemattomien mallipohjien tehdä työsi. Pystyt viemään yhdessä hujauksessa jopa yksittäisiä kohtauksia pitkästä videosta. 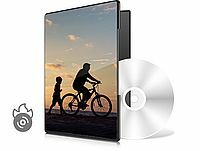 Näin voit tehdä esimerkiksi valikollisia video-DVD-™ ja Blu-ray Disc™ -levyjä tai taikoa ensiluokkaisia diaesityksiä omista lomamuistoistasi. Olipa kyseessä video-DVD*-, ääni-CD*- tai video- ja äänitiedostot*: Nero 2017 Classic konvertoi lähes kaiken sinulle sopiviin video- ja äänitiedostomuotoihin. Voit laatia Classiciin näppärästi omia työlistoja suunnitelluista konvertoinneista. Vieläkin helpompaa on video- ja ääni-CD-levyjen konvertointi mobiililaitteeseesi yhdellä napsautuksella: liitä laite, valitse nimi, siirrä tiedosto -ja tässä kaikki. Nero 2017 Classic tukee myös uusimpia mobiilipäätelaitteita. Gracenote®-palvelun ansiosta voit lajitella ja toistaa musiikkikappaleita mobiililaitteella myös albumeiden kansien perusteella. Enää sinun ei tarvitse etsiä loputtomasti oikeaa tiedostoa: Nero MediaHome huolehtii siitä, että sinulla on kasvojen, paikkojen ja muiden hakusanojen perusteella yleiskatsaus valokuviin, filmeihin ja omaan musiikkiin ja että voit liittää ne helposti omiin projekteihisi. Eikä tässä kaikki: Nero MediaHome on myös tehokas video- ja äänentoistolaite video-DVD-, ääni-CD-levyille sekä musiikki- ja videotiedostoille, joita voit toistaa myös tekstitysten kanssa. Maksuttoman Nero MediaHome WiFi Sync -sovelluksen mukana saat myös tuotua iOS- ja Android-laitteet samalle tasolle kuin mediakirjastosi. Jos multimediaalinen elämäsi tapahtuu lähinnä olohuoneen suurella TV-ruudulla, streamaa tiedostot maksuttoman Nero StreamingPlayer -sovelluksen ansiosta helposti käyttämääsi tai toiseen kotiverkkosi laitteeseen. Nero 2017 Burning ROM – Poltto-ohjelmien eliittiä! Aseta uudet standardit luotettavan Nero Burning ROM:in polttoteknologian avulla! Kopioitko ja tuotko tiedostoja sekä musiikkia ja poltat valitsemiasi levytyyppejä? Teetkö erittäin luottamuksellisia levyjä? Tämä kaikki onnistuu Nero Brenn-Profis -ohjelmalla, joka huolehtii SecurDisc 4.0:n ja monen muun ominaisuuden avulla parhaasta lopputuloksesta! Jos tarvitset ääni-CD-levyjäsi ja yksittäisiä musiikkikappaleita tiedostona PC:llä, älypuhelimella tai MP3-soittimella, muunnat ne sopiviksi ja tarvitsemaasi muotoon käden käänteessä! Nero Burning ROM tarjoaa kaiken: MP3:sta, MP3 PRO:sta AAC:hen ja FLAC:ista aina APE:en – mukana kappaleiden nimet ja albumien tiedot. Myös jopa alkuperäiset albumien kannet löytyvät nyt integroidun Gracenote®-teknologian ansiosta äänitiedostosta. Näin voit hakea kätevästi soittolistojasi ja toistaa omaa musiikkiasi huoletta. Haluatko jakaa filmejä ja pitää suosikkihittejäsi valmiina autossa ja olohuoneessa kuunneltavaksi? 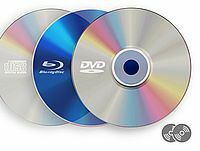 Kopioi CD-, DVD- ja Blu-ray Disc™ -levyjä ilman, että ne jäävät jälkeen alkuperäisestä äänenlaadusta! Myös ääni-CD-levyt syntyvät nopeasti – mukaan lukien CD:n tekstit sekä alkuperäisten albumien tiedot ja kannet! Valitse vain paras polttamisen asiantuntija kaikille levytyypeille, haluatpa ikuistaa omat suosikkimuistosi CD-, DVD- tai Blu-ray Disc™ -levyllä. Laadi ISO-tiedostoja tai polta videolevyrakenteita ja näköistiedostoja uudelle tietovälineellesi. Vielä soinnukkaampia saat myös poltetuista ääni-CD-levyistä, joita voit kohentaa automaattisella äänenparannusominaisuudella sekä suodattimilla ja muilla säädöillä oman makusi mukaan. Gracenote®-teknologian ansiosta saat myös alkuperäiset albumin kannet MP3-CD- ja uuden autoradiosi MP3-DVD-levylle. Uuden Nero CoverDesignerin avulla teet poltetuista töistäsi myös optisesti aitoja taideteoksia! * *Ei koske kopiosuojaamattomia medioita. Suojaa se, mikä on sinulle tärkeää! Älä jää turvallisuusasioissa ammattilaisista jälkeen: uuden SecurDisc 4.0 -teknologian ansiosta tiedostosi ovat hyvissä käsissä. Teollisuusstandardin mukaisen 256 bittisen koodauksen, digitaalisen allekirjoituksen ja salasanasuojauksen ansiosta itsesi lisäksi kukaan muu ei pääse käsiksi tietoarkistoosi. Koska Nero pyrkii pitkäikäisyyteen ja luettavuuteen, muutettavissa olevan tietojen virheensietokyvyn ansiosta jopa naarmuuntuneita levyjä pystytään toistamaan. Safe data archiving and modern multimedia applications for companies, government- and educational institutions and all other organizations.